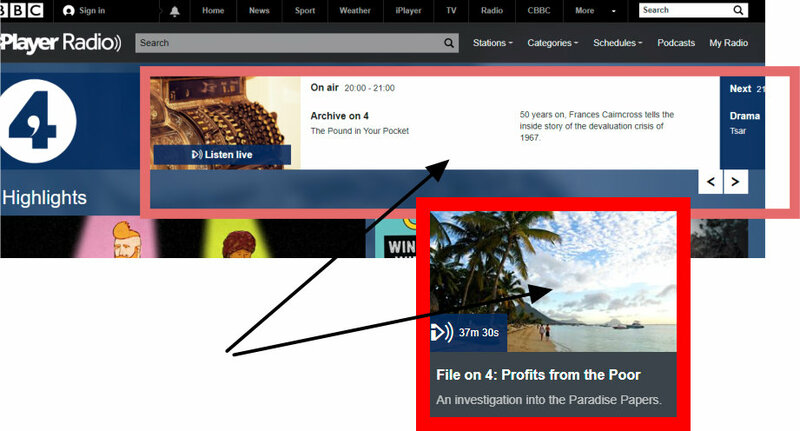 In the week that BBC News is filled with "the Paradise Papers " which disclose companies and Royal interests all tucked up in the Cayman Islands, as I write this blog, Radio 4 is doing one of its interminable "explanations of financial history" but as usual missing the entire top third and most important factors in what it should be explaining. Imagine introducing the profession of the Punch and Judy Show but not referring once to the " how tos" of glove puppetry, Oh...Punch and Judy just move themselves. This is the BBC idea of a lecture on finance and the history of the pound. 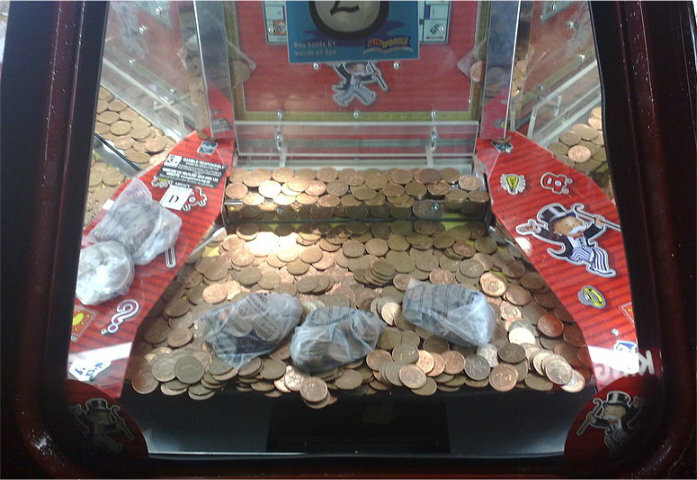 A Look at a Penny in the slot machine in a gaming arcade. and secondly the red plastic cover strips hiding gaps where a portion of the money on both sides is filtered off and kept for the profit of the arcade. The BBC are sworn to secrecy about the equivalent red covered areas in our country's finances. The truth is we are in desperate hock to bankers and financial institutions, and to the secret orders that control them. We are more or less forced into wars. (This is Armistice day) Then our Government which cannot afford the wars, is forced to borrow money at exorbitant interest. Then when it cannot meet the interest repayments, it borrows more, or the interest rates are raised. None of this is passed onto you by the media in case of revolt. The City of London and the Corporation of Washington are privately owned, so both America and the United Kingdom have the appearance of being just about solvent. But this isn't so because neither America nor UK tax payers have access to any of this money, we just add to their money mountain. While we are mentioning Armistice Day , which has always sailed past me until my wife reminded me that is was commemorating 11/11/1918.Here is a columnist writing about the occult significance of 11. It's all prearranged. The original is here. Today is New Year’s Day. Numerically, it’s 1/1. So it’s an auspicious day to talk about the Illuminati’s penchant for the number 11. I was introduced to Illuminati numerology by Captain Eric May, the Army Intelligence Analyst turned mainstream op-ed writer. I helped convince Captain May to come out publicly for 9/11 truth in 2005, and published his “coming out article” at MUJCA.com. Needless to say, that ended his career writing op-eds for NBC News. It sounded like the John Nash character in “A Beautiful Mind.” Captain May explained that the Illuminati had put out “A Beautiful Mind” in 2001 as a pre-emptive strike against people like him who might figure out their 9/11 codes. Was Captain May crazy, a genius…or both, like John Nash? When Captain May came down with ALS (Lou Gehrig’s Disease) not long after taking on the “Synagogue of Satan” I took it as an indication that he might be on to something. In the end, I had to admit that Captain May was right: The Synagogue of Satan that carried out 9/11 seems to have an affinity for the number 11. So in honor of 1/1, here are 11 cases of Illuminati numerology. 1. The New World Order banksters introduced the Euro on 1/1 of 1999. Note that the digits “999” are not just “666” upside down, they also contain “99” which is a multiple of 11…and not just any multiple! 1/1/1999 does seem to bear an uncanny resemblance to 9/11, which a few years later became the biggest, most emotionally powerful numeric symbol in human history. 2. On 1/1/1999 the Euro was introduced in exactly 11 countries. 3. As mentioned earlier, the Twin Towers were obviously the Twin Pillars of Jachim and Boaz, the primordial symbols of freemasonry…which together formed a gigantic number 11. This is probably the main source of Illuminati fascination with 11. 5. The 2004 Indian Ocean tsunami – supposedly “the deadliest tsnunami ever” – occurred on 12/26. 1+2+2+6 = 11. An apparent NWO website offers “11 Facts About the 2004 Indian Ocean Tsunami.” Was this really a natural event? Or can seabed nukes and/or HAARP-style technologies trigger earthquakes and tsunamis? 6. Though the 2004 tsunamFukushima_1-320x246i killed 350,000, another unnatural-looking tsunami will eventually kill millions. That, of course, would be the “Fukushima tsunami” of 3/11/11. This date not only has two big fat juicy elevens, it also bears an uncanny relationship with 9/11 and the subsequent 3/11 Madrid follow-up. If you add up all the digits in 3/11/2011 you get “9”, and if you write the date in international style (11/3/2011) you get 11 3squared 11. Recall that in December 2010 the NWO banksters allegedly threatened to use an “earthquake weapon” on Japan if it didn’t hand them its Postal Bank, the biggest savings bank in the world. Was Fukushima the result of an undersea Israeli nuke plus stuxnet-style sabotage? 7. The phony “killing of Osama Bin Laden” occurred on 5/2/2011. Those digits add up to – what else – 11. And if you add them in order, you get: 5 + 2 +2 = nine; then you add the final two ones which form “11” and take you to eleven. 8. Which reminds us that the aforementioned Madrid bombings, the follow-up to 9/11, occurred on 3/11/2004…a date with a big juicy 11 in the middle, a date which falls exactly 911 days after 9/11. If we add up the digits of 3/11/2004 we get – what else – 11. And if we write the date in the international style as 11/3/2004 we note that the numbers following the initial 11 add up to 9…sort of like the “Bin Laden killing” date in reverse. What’s more, the official death total (peddled by the Zionist media) was 191 – two ones and a nine, which added together make 11. 9. The World Trade Center took 11 years to construct; and not only did two of its built-for-demolition skyscrapers form a gigantic 11 (and rise to 110 stories), the third skyscraper had 47 stories (4 + 7 = 11). 10. Construction began on the Pentagon on 9/11/1941 – exactly sixty years to the day before the big human sacrifice. Note that “Pentagon” (pentagram) is the #2 satanic/freemasonic symbol after the Twin Towers, I mean the Twin Pillars, of Jachim and Boaz. No freemason beyond the .0001th degree could possibly hear about an attack on the Twin Pillars and the Pentagram without getting the message. Note that a plane/missile describing a slightly curving flight path into a pentagram looks like a 9, just as the Twin Pillars form an 11. 11. Finally, as all Veterans Today readers know, Veterans day is 11/11, commemorating the eleventh hour on the eleventh day on the eleventh month of 1918 when the New World Order in general, and the Zionist occupation of the Holy Land in particular, began to arise from the ashes of European civilization.